Howard, C. D. (2011). Web 2.0 sites for collaborative self-access: The learning advisor vs. Google®. Studies in Self-Access Learning Journal, 2(3), 195-211. While Web 2.0 technologies provide motivated, self-access learners with unprecedented opportunities for language learning, Web 2.0 designs are not of universally equal value for learning. This article reports on research carried out at Indiana University Bloomington using an empirical method to select websites for self-access language learning. Two questions related to Web 2.0 recommendations were asked: (1) How do recommended Web 2.0 sites rank in terms of interactivity features? (2) How likely is a learner to find highly interactive sites on their own? 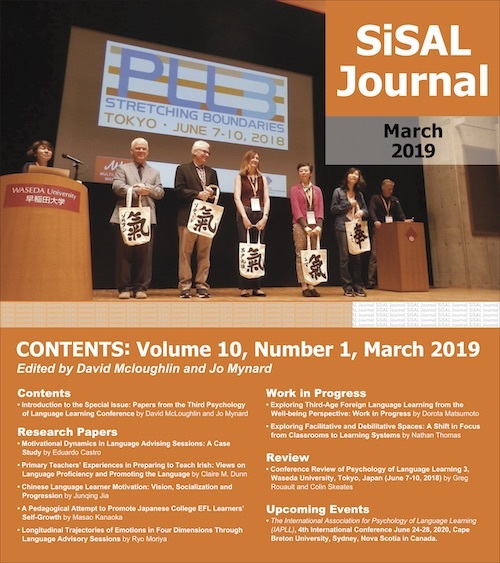 A list of 20 sites used for supplemental and self-access activities in language programs at five universities was compiled and provided the initial data set. Purposive sampling criteria revealed 10 sites truly represented Web 2.0 design. To address the first question, a feature analysis was applied (Herring, The international handbook of internet research. Berlin: Springer, 2008). An interactivity framework was developed from previous research to identify Web 2.0 design features, and sites were ranked according to feature quantity. The method used to address the second question was an interconnectivity analysis that measured direct and indirect interconnectivity within Google results. Highly interactive Web 2.0 sites were not prominent in Google search results, nor were they often linked via third party sites. It was determined that, using typical keywords or searching via blogs and recommendation sites, self-access learners were highly unlikely to find the most promising Web 2.0 sites for language learning. A discussion of the role of the learning advisor in guiding Web 2.0 collaborative self-access, as well as some strategic short cuts to quick analysis, conclude the article. The motivated self-access learner has countless options available via Web 2.0 sites for “rich exposure to the [target] language in use” (Tomlinson, 2010, p. 72). The problem facing such a learner is which Web 2.0 collaborative language learning site to choose, or how to find the most promising site for learning. Web 2.0 sites are characterized by collaboration and collective intelligence (O’Reilly, 2005), but no search engine function presently exists to find them automatically. Empirically determining which sites will prove most beneficial for learners’ time investment is a task which must be done by teachers, or learning advisors, through careful observation. Tim Berners-Lee, the inventor of the web, has pointed out that none of the so-called new technologies in Web 2.0 are defined by the software the web uses; “Web 2.0 is a piece of jargon — nobody really knows what it means” (Laningham, 2006, audio-n.p.). For self-access learners and their learning advisors, the web for language learning remains an interconnected quagmire of unorganized opportunities. Google retrieved 35 million hits for the search term “online learning” when the recommendation list used in this study was first compiled in 2008. Since that time, this number has risen to 94 million hits in September of 2011. Guidance is sorely needed if learners or their teachers are considering investing valuable time on the web. In the context of a large university, the problem of selecting the most advantageous sites for self-access language learning is inter-disciplinary. If a website for self-access learning is suggested, recommended or assigned, it is the responsibility of the institution to vet the selected site. If a learner is set out on their own, the school would be wise to understand just what that decision entails. These decisions may be approached from a number of different perspectives. This study brings an information science perspective to decisions made about Web 2.0 site recommendations for language education. Which Web 2.0 recommended sites show the highest potential for self-access learning opportunities in terms of interactivity design features? How likely would it be for a self-access learner to find the most interactive recommended Web 2.0 sites on their own? In internet-mediated environments for language learners, inter-language communication strategies have been shown to relate to the mode of CMC (Kitade, 2000; Levy & Stockwell, 2006; Negretti, 1999). In other words, learners are cognizant that different communications skills are at play in different modes. For example, synchronous and asynchronous opportunities hold different, and possibly complimentary, affordances for the language learner. This suggests that more design features mean more opportunities for learning. Stockwell (2007) argued that technology is inherently linked to pedagogical goals in computer-mediated learning designs. Felix (2002) surveyed student perceptions of language learning made with web-based technologies and concluded that some features within web technologies afford access to learning experiences not available in traditional face-to-face classrooms. If different modes, and configurations within modes, impact the potential for learning– the more features the better. Collaborative self-access language learning is not new and has appeared under various names since the inception of the web including: internet-mediated language learning, collaborative exchanges, long distance CMC, and as a branch of Computer Assisted Language Learning or CALL (Appel & Mullen, 2000; Chapelle, 2005; Howard, 2011; Kern & Warschauer, 2000; Nunan, 1994; Warschauer, 2000; Zhao, 1996; Zhao, 2003). A constant among all these studies is that language learning opportunity has a direct relationship to the design of the supporting medium. The Web 2.0 generation of websites for language learning is challenged with providing a range of opportunities via multiple design features that address all the demands of collaborative self-study. The quantity of design features of the Web 2.0 site determines access to language learning opportunity. The advantages of having multiple channels of internet-mediated person-to-person communication are well documented in studies of language learning support media and CALL (Kitade, 2000; Stockwell, 2007; Zhao, 2003). Web 2.0 introduces another demand, access to language authority. Because the instructor is removed, most instances of learner-to-learner interaction must be automated by the website and the language authority accessed is the more proficient speaker. Thus an important aspect of Web 2.0 sites for self-access is the presence of what Vygotsky (1978) terms the informed other. A diverse range of participating members involved in peer-tutoring is a crucial aspect of Web 2.0 learning. Therefore, the design of these sites must both facilitate learning and provide language authorities. This requires that a high number of design features contain not only content access, but interaction possibilities. The quantity of design features which link learners, language authorities, and content are the keys to unlocking language learning opportunities in Web 2.0. Taxonomies have been used to evaluate the design of websites for learning. Moore (2006) and Moore and Kearsley (1996) put forth a paradigm of three types of interactions in distance education: learner-content, learner-instructor, and learner-learner. They point out that learner-learner interaction is often the weakest part of at-a-distance designs. Other research had identified a fourth dimension, learner-interface (Hillman, Willis & Gunawardena, 1994). Chou (2003) combined these four categories for a study which investigated the designs of websites for self-study, and asked designers to rank the features by importance. She found that designers identified more than half of the features as “must have,” further supporting the notion that, when it comes to interactivity features in self-study websites, the more features the greater the opportunity for learning. Chou’s (2003) taxonomy is the most comprehensive taxonomy developed before this study. Three criteria were applied to determine which of the 24 sites recommended by the interdisciplinary research group were actually representative of Web 2.0. All the recommended sites had been created between 2005 and 2008, had been fully completed, and had a minimum critical mass of web traffic. I define minimum critical mass as a minimum of 100 learner contributions in the previous week from when the website was reviewed. Sites included in this study must be free and open to the public. This ensures the widest range of users. Barriers limit access and are not characteristic of Web 2.0. Sites must offer multiple languages. Collective knowledge of the user base is the driving force behind the concept of Web 2.0. Therefore, the sites included in this study must offer at least some access to users from different native languages, or at least advanced language users of different languages. Peer-tutors in single language sites does not present a plausible Web 2.0 dynamic. In such cases, the most advanced would have no incentive to participate. Learners must participate as instructors in order to develop a language learning community; thus, sites designed to cater to a single language cannot represent a Web 2.0 design. Sites which offered no language content were excluded. Those which focused exclusively on learner-learner interaction without any type of pedagogical support were considered social network sites, and not language learning sites. Any static content, (video, audio or textual/visual) qualified a site as a language learning site. In clarifying these criteria it is important to recognize why certain websites were omitted. Since the fundamental aspects of Web 2.0 are collaboration and collective intelligence (O’Reilly, 2005) learners are not always authorities of the language their interlocutor wants to learn. In order to allow for optimal collaboration, websites must provide for multiple configurations of language groupings– learners helping those who in turn help someone else. A Web 2.0 user does not expect the person they tutor to tutor them back, but they do expect to find that help from somewhere within the community. I therefore excluded sites where language exchange is exclusively one-to-one because those sites are by definition not Web 2.0. Penpal, keypal and intercambio sites are therefore not representative of Web 2.0. As Chou’s (2003) theoretical framework for interactivity on the web is adapted from Moore & Kearsley’s (1996) model, the framework used in this study is adapted from Chou’s. Chou (2003) grouped features into four main areas, and these remained in this study. However, using grounded methods, individual features were added to reflect Web 2.0 affordances. Feature analysis is a type of content analysis common to studies of websites (Bates & Lu, 1997; Herring, 2008; Schneider & Foot, 2004). The unit of analysis was the website. Features added to Chou’s (2003) taxonomy are listed in Table 1. To address the operationalization of both the new and the Chou (2003) codes, five of the ten sites were coded together by myself and another member of the interdisciplinary research group. Chou’s (2003) taxonomy contained 36 separate features which were combined with 18 new features unique to websites after Web 2.0. In total, 54 total features comprised the final taxonomy. A separate coding of the second five sites resulted in an inter-rater agreement of 96%. The two coders met again to decide on the correct code for each result on which they differed. There were no codes which were left in disagreement between the two coders. On the web, interconnectedness is everything (Berners-Lee & Fischetti, 1999; Schneider & Foote, 2004). To answer the second research question, methods were applied to determine two types of interconnectedness – direct and indirect interconnectedness. To determine direct connectedness, likely search terms were entered in Google and the first 200 returns were scanned for websites which had been recommended and had qualified as Web 2.0 language learning websites. Direct connectedness is far more powerful than indirect connectedness because the learner does not need to navigate through another website to access the Web 2.0 site for the first time. Indirect connectedness is determined by the quantity of inbound links a website supports. Google recognizes and reports all inbound links and these are shown through reverse search engines or back-link checkers. Back-link checkers identify not only the quantity of inbound links to a site, but also their originating URL. Qualifying websites’ front page URLs were entered into a free and open source back-link checker, linkpopularity.com. A negative Boolean search was used to remove intra-site links, i.e. : links to the front page which originated from within the site itself. The resulting links as reported by Google were tallied. Indirect connectedness is defined here as a measure of how likely a learner is in finding a recommended site from another site on the web, e.g. : a language learning recommendation blog, a university homepage, or a teacher’s blog. Connectedness measures were not aggregated because of the qualitatively different nature of the two measures. Ten websites from the recommendation list qualified for analysis: babbel, babelnation, ephisto, italki, kantalk, livemocha, linq, palabea, polyglot-learn-language, and vocabulix. Recurring parts of the URLs (e.g. : “http://” or “.com”) are deleted from this article. Polyglot-learn-language is shortened to polyglot in this article. RQ1: Which Web 2.0 recommended sites show the highest potential for self-access learning opportunities in terms of interactivity design features? While it was expected that no website would have all the features, italki contained the most features, 34 (63%) of the codebook’s possible features. In contrast, babelnation contained the least, only 15 of the 54 features, or 28%. The three sites with the greatest number of features, italki, ephisto and palabea, each had more than double the number of features than the site with the fewest, babelnation. The median was 26 features, and only two sites had the same number of features, 32. The average number of features per site was 25.5. A comparison of the total number of features in each site can be seen in Figure 1. Across all the sites, the most common interactivity group was learner-content, and this category appeared to the greatest extent in the palabea site, where 13 different content interactivity features could be found. No discernable pattern to the designs was evident in the analysis for learner-content interactivity features; higher ranked websites overall did not necessarily contain large numbers of learner-content features, nor any single type of learner-content feature. In the learner-content category, three sites offered only 9 features (babelnation, lingq, and polyglot). It may be worth noting here that these three offered upgrades of some kind where one could pay for more access to content, either through the site itself or through another product. 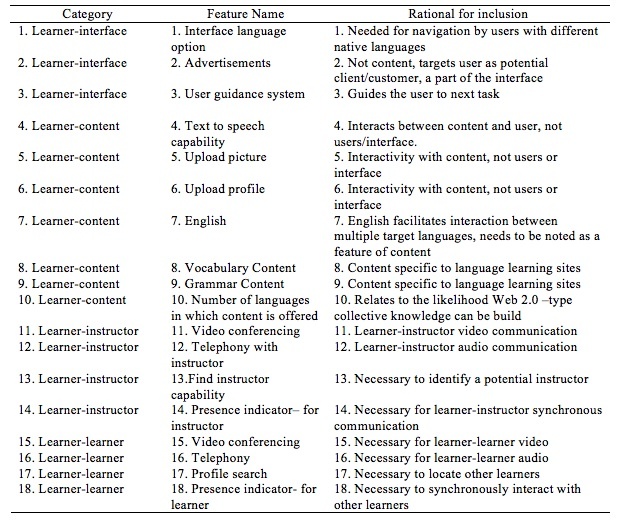 The smallest range of features within one category was found in the learner-interface manifestations across the sites. In this case, the fewest number of features was 4 and the greatest was 6. In essence, Web 2.0 sites do not vary greatly in terms of learner-interface features. The websites babbel and ephisto contained this highest number of learner-interface features (6), and babelnation the fewest, 4. All others ranked in between with 5. The interactivity category which produced the widest range of features was the learner-instructor category: italki contained 10 features for learners to contact native speakers or instructors, and babelnation only offered a bulletin board system where learners could post questions and hope that a more proficient speaker would respond via that bulletin board. The feature group with the fewest number of possible features was the learner-learner interactivity grouping. Similar to the results of studies by Moore and Kearsley (1996) and Chou (2003), this is the main area where websites consistently failed to support learners with a wide range of options. Both babelnation and lingq contained only one feature in this group, where each provided only a bulletin board system for learners to have contact with each other. Because the learner-learner category had the smallest number of possible features, design performance was easiest to identify in this category. The average number of appearances of any learner-learner feature over the ten sites was 5.4. No one site contained all the learner-learner features; however, three common interactivity features appeared on seven of the ten sites. The common features were: (1) to asynchronously message another learner, (2) search learner profiles, and (3) identify if another learner was online using some kind of presence indicator. Because these are the most common learner-learner interactivity features, it can be expected that a well designed Web 2.0 site for language learning will have these three features. Synchronous interactivity features, however, only appeared on sites with high rankings in design features across the board. While six of the ten recommended sites offered bulletin board systems, the second most common learner-learner interactivity feature, only three of ten offered synchronous chat, telephony, or video conferencing. Learner-learner synchronous features co-occurred with design performance, always appearing on sites in addition to asynchronous features. RQ2: How likely would a self-access language learner be in finding the most beneficial recommended Web 2.0 sites on their own? The interdisciplinary research group provided a number of search terms learners had used, or learners had said they had used. The terms were collected and discussed in the research group. The list was narrowed via consensus about which terms or phrases learners were likely to use on their own. Table 2 presents these phrases on the left with the number of total results to the right of each phrase. The two columns on the right in the table show the frequencies of qualifying websites appearing in Google search results for these search phrases. For each search, I scanned the first 200 results with one member of the research group. Thus, in the end, two researchers scanned the 1000 search results for the five search phrases. Quotes around the phrases were used to narrow results, and avoid unrelated websites. “Learn English online” was included because English was reasoned to be a lingua franca in Web 2.0 websites, even though it may not have been the target language for many of the learners. Four of the nine websites that appeared in the first 200 results ranked in the top 3 in terms of interactivity features. Italki, the number one ranking website, appeared twice, as did Starbuck’s Coffee’s web initiative, livemocha. Thus the learner who brings no discrimination (random clicking on search results) has a less than 1% chance of actually visiting a Web 2.0 site, and a 0.4% chance of selecting one of the top three Web 2.0 recommended sites. Table 2. Search terms and the qualifying websites which appeared in the first 200 results in Google; interactivity rank appears following each website name. Results from the back-link checker for front page URL’s (minus inbound links) showed a wide range, from 14, 146 (livemocha #4) to 235, (ephisto #2). The highest indirect connectivity site contained more than 60 times the number of inbound links than the lowest ranked indirect connectivity ranked site. The average number of links into the 10 qualifying Web 2.0 language learning sites was 4,498, and the median number of inbound links was 2,515. Internet-wide, there was a total of 44,983 links into the 10 qualifying Web 2.0 language learning sites, and 11,502 into the top three sites in terms of design features. The number of inbound links from other domain names is shown for each front page of each site in Figure 2. Figure 2. Number of inbound links (excluding links originating from within the domain) found on linkpopularity.com for each recommended and qualifying Web 2.0 site. 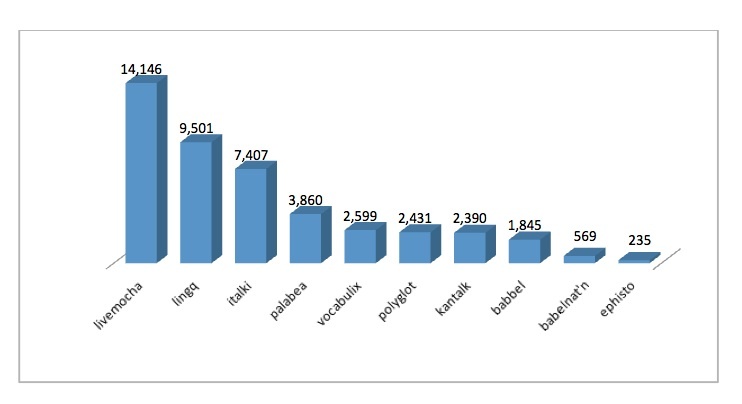 The two highest ranks in terms of design features were occupied by three websites: Italki, ephisto and palabea. In terms of design features resulting in learning opportunities, the highest probability for learning gains are on those three sites. This method of analysis was laborious; however, it also uncovered a curious indicator of design investment which could potentially save planning time for self-access learning advisors. Learner-learner interactivity features, the traditionally weakest area of self-study design, continues to be the greatest indicator of overall effort in creating the self-study environment. The highest ranking Web 2.0 sites overall also contained the most uncommon learner-learner interactivity features, but varied in their ensemble of other features. This suggests learning advisors (or learners themselves) could look directly to levels of learner-learner support to identify the highest quality Web 2.0 sites for language learning. The learner-learner interactivity category is the area that separates poorly designed websites from websites with wider ranges of features that learners can use. The top three sites overall, italki, ephisto and palabea each offered not only asynchronous media such as bulletin boards, but at least one form of synchronous learner-learner interactivity: chat, telephony, or video conferencing. The lower ranking sites also showed this relationship as they lacked the more sophisticated learner-learner design features. These relationships could be used as a quick litmus test for Web 2.0 sites. By simply counting the learner-learner opportunities, a learning advisor could quickly determine the potential that a site would waste learner time on unanswered interactions. The top three Web 2.0 sites had seven or eight distinct forms of learner-learner interaction. Less robust designs had fewer than seven, and the three lowest ranked websites had only two or three learner-learner interactivity features. For example, had a learner invested time in babelnation, with only one form of learner-learner interaction via a BBS discussion board, it is highly unlikely their effort would be rewarded with a Web 2.0 learning experience. There is no indication that a question a learner posed on a bulletin board will be answered, and no indication that learners going to babelnation will encounter an interlocutor. However, if a learner were in a chat room on palabea, and another learner suggested a live telephony conversation, the learners would undoubtedly experience at least 2 forms of uncommon Web 2.0 learning- the textual chat, and the verbal chat. The power of Web 2.0 designs can be surmised simply from learner-learner interactivity features. Self-access learners are very unlikely to find higher quality Web 2.0 sites on their own. Using Google, and assuming learners may not recognize advertisements disguised as Web 2.0 language learning sites, these data suggested a 0.9% chance that a learner will find one of the recommended sites, and a 0.4% chance that they will encounter one with a high number of design features. Of course, there is always the possibility of new Web 2.0 language learning sites in development, but high quality websites require significant investments of time, expertise, and financial support. Highly sophisticated, free sites which compete for the open market of learners on the web are unlikely to appear without a significant technological disruption. Disruptions do come regularly, but they are not predictable events. Mobile computing is an example of a technological disruption which has come, but has not impacted Web 2.0 design. Other well designed sites which were not identified by the research group could very well be available since the completion of this study. The indirect interconnectivity data also suggests a rather bleak forecast for the learner who tries to find the higher quality Web 2.0 sites via blogs or written recommendations on the web. The highest ranking back-linked website, livemocha (#4 in terms of design features), drew approximately twice the number of links as the highest ranking Web 2.0 site in terms of design features. It is little consolation that the site with the fewest learning opportunities, babelnation site ranks 2nd lowest on the indirect measure of connectivity and does not appear on direct measures of connectivity at all. Even aggregating all the inbound links of the top three designed sites does not match the highest web-presence site, livemocha, a public relations initiative created by the coffee manufacturer, Starbucks. This study suggests that, using measures of feature analysis and interconnectivity, one can empirically state that the self-access learner is unlikely to find a well designed Web 2.0 language learning site via a search engine without the help of an advisor. The sample of websites used in this study was not meant to be exhaustive, nor was it meant to be timeless. Some might view websites created between 2005 and 2008 as already outdated, but this was the time when Web 2.0 had reached its pinnacle and designers were both versed in its features and still interested in creating quality designs within the genre. 2010 provided a good vantage point to study Web 2.0 because the sites used in this study are representative of the genre in its maturity, and were still regularly attended when they were studied. New web sites will be developed, but the genre itself will persist as it incorporates features from new approaches to interaction. While the sites themselves are not timeless, the measures appear to be. Societies add technologies more often than they replace them (Gleick, 2011). The next wave of design innovation has come in the form of semantic design features rather than interactivity features (Collins & Quillian, 1969). More recent designs have changed focus from interconnectivity to mining for automated interactions, following the breakthroughs in XML, smart agents, and semantically organized content. Web 3.0 sites will not have a fixed set of features, a critical mass of users, nor a reliable set of evaluative measures until sometime after the genre has reached maturity. By the mid 1990s the web had already developed web-quests and collaborative email exchanges; many of these activities are still in use today and evaluated by the measures developed right after those designs became popular (Howard, 2011). There is little indication that the age of the sites here have any impact on the validity of ranking them in this manner, nor is there any indication that the ranking measures I have used here are any less valid now than they will be years from now. If anything, the present trajectory of the web suggests that more studies of design features and how they relate to interconnectivity are sure to come. Lucy Cooker (2010) made the case that self-access learning should be truly self-access (i.e. not homework disguised as self-access learning) and should be fun. I have made the case here that despite the accolades afforded to Web 2.0 designs for learning, language learning for the unassisted learner on Web 2.0 would not only be frustrating instead of fun, but would likely not amount to much access to learning opportunities. Each self-access center must strategize an approach to recommending websites for self-access collaborative study. This article has presented one possible method of making that decision, but the individual contexts of students and the value systems of each center will, of course, be the final determiner. The approach I have taken uses methods more common to studies in information science than linguistics or education; barrowed methods can provide unique insights to problems closer to home. Simply counting interactivity design features allowed us to make a decision based on evidence in a context where comparative evidence is difficult to create. I am indebted to Miguel Lara of the Instructional Systems Technology Department at Indiana University for suffering with me through the coding of 54 features over the 10 websites, and scanning hundreds of search results for Web 2.0 sites. I am further indebted to Curt Bonk’s Research Group for Online Language Learning who provided the initial list and search terms, and to Susan C. Herring for teaching me these methods and giving me feedback on an earlier version of this paper. Craig D. Howard is the Assistant Editor of the International Journal of Designs for Learning and a PhD Candidate at Indiana University in Instructional Systems Technology. He holds an MA from Teachers College Columbia University and has taught at the City University of New York and Kanda University of International Studies in Chiba, Japan. His research focuses on online communication and developing online pedagogy. Appel, C., & Mullen, T. (2000). Pedagogical considerations for a web-based tandem language learning environment. Computers & Education, 34(3-4), 291-308. Bates, M. J., & Lu, S. (1997). An exploratory profile of personal home pages: Content, design, metaphors. Online and CDROM Review, 21(6), 331-340. Berners-Lee, T., & Fischetti, M. (1999). Weaving the Web: The original design and ultimate destiny of the World Wide Web by its inventor. San Francisco: Harper. Chapelle, C. A. (2005). Computer-assisted language learning. Cambridge University Press. Chou, C. (2003). Interactivity and interactive functions in web-based learning systems: A technical framework for designers. British Journal of Educational Technology, 34(3), 265-279. Collins, A.M., & Quillian, M.R. (1969). Retrieval time from semantic memory. Journal of verbal learning and verbal behavior 8 (2): 240–247. doi:10.1016/S0022-5371(69)80069-1. Felix, U. (2002). The web as a vehicle for constructivist approaches in language teaching. ReCALL 14, 2-15. Gleick, J. (2011). The information: A history, a theory, a flood. Pantheon Books. Herring, S. C. (2008). Web content analysis: Expanding the paradigm, in J. Hunsinger, M. Allen, and L. Klastrup (Eds. ), The international handbook of internet research. Berlin: Springer Verlag. Hillman, D. C. A., Willis, D. J., & Gunawardena, C. N. (1994). Learner-interface interaction in distance education: an extension of contemporary models and strategies for practitioners. The American Journal of Distance Education, 13(3), 22-36. Howard, C. D. (2011). An instructional paradigm for the teaching of computer-mediated communication. Instructional Science, 39(6), n.p. DOI: 10.1007/s11251-11011-19187-11250. Kern, R., & Warschauer, M. (2000). Theory and practice of network-based language teaching, in M. Warschauer and R. Kern, (eds. ), Network-based language teaching: Concepts and practice. New York: Cambridge University Press. Kitade, K. (2000). L2 learners’ discourse and SLA theories in CMC: Collaborative interaction in internet chat. Computer Assisted Language Learning, 13(2), 143-166. Laningham, S. (2006). “developerWorks Interviews: Tim Berners-Lee”. City: IBM, pp. http://www.ibm.com/developerworks/podcast/dwi/cm-int082206txt.html. Levy, M., & Stockwell, G. (2006). CALL dimensions: Options and issues in computer-assisted language learning. Mahwah, New Jersey: Lawrence Erlbaum Associates, Inc.
Moore, M. G., & Kearsley, G. (1996). Distance education: A systems view. Belmont, CA: Wadsworth Publishing. Negretti, R. (1999). Web-based activities and SLA: A conversation analysis research approach. Language Learning & Technology 3(1), 75-87. Nunan, D. (1994). Introduction in D. Gardner & L. Miller (Eds. ), Directions in self-access language learning. Hong Kong University Press. O’Reilly, T. (2005). What is Web 2.0: Design patterns and business models for the next generation of software. retrieved from: http://oreilly.com/web2/archive/what-is-web-20.html. Schneider, S. M., & Foot, K. A. (2004). The web as an object of study. New Media & Society, 6(1), 114-122. Stockwell, G. (2007). A review of technology choice for teaching language skills and areas in the CALL literature. ReCall, 19, 105-120. Warschauer, M. (2000). The death of cyberspace and the rebirth of CALL. English Teachers’ Journal, 53, 61-67. Zhao, Y. (1996). Language Learning on the World Wide Web: Toward a framework of network based CALL. CALICO, 14(1). Zhao, Y. (2003). Recent developments in technology and language learning: A literature review and meta-analysis. CALICO, 21(1), 7-27. Appendix: Websites provided by the Indiana University Research Group for Online Language Learning. * indicates sites selected for analysis in this study.